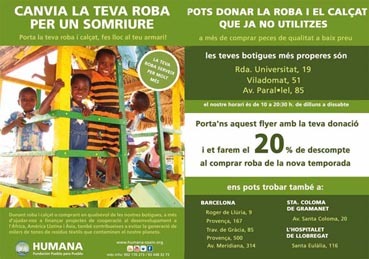 Humana encourages the donation of used clothing in the San Antoni and El Raval neighborhoods in Barcelona. All donors will receive a 20% discount on all purchases at the three area Humana stores. Fundación Pueblo para Pueblo, a non-governmental organization for development (NGO) that has been working since 1987 to finance cooperation projects in Africa, Latin America, and Asia through the management of resources textiles, has today launched the campaign "Exchange your clothing for a smile". This campaign is intended to encourage the donation of used clothing and footwear in the San Antoni and El Raval neighborhoods of Barcelona. The proceeds from the collection, sorting, and sale of the used clothing donated during this campaign will go to educational programs being conducted by Humana in Mozambique. Each kilo of clothing collected will result in approximately 8 cents for these programs. Donors can bring their used clothing and shoes to any of the three shops in the area (located at Ronda Universitat 19, Viladomat 51, and Parallel Avenue 85) or the other seven Humana stores in Barcelona and its metropolitan area. Donors can also place their items in any of the 22 containers in Barcelona. Those who prefer to donate their items in the three stores in San Antoni and El Raval will benefit from a 20% discount on all purchases at those stores. To receive the discount, donors need only show one of the 30,000 informational flyers that were distributed to encourage participation in the campaign.